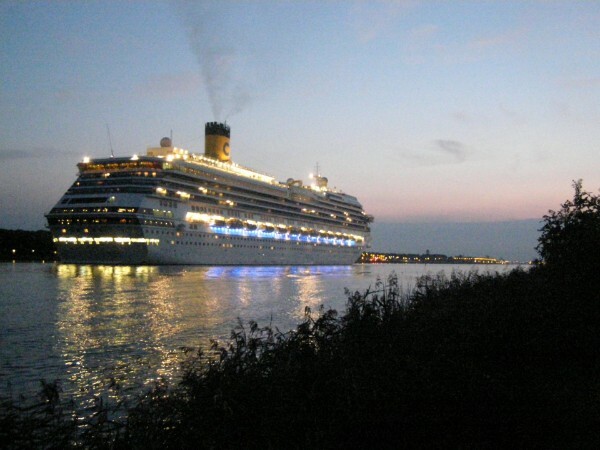 Costa Pacifica after her first visit to The Netherlands, seen sailing past the village of Velsen-Noord at the 6th of september 2013. On the 14th of december 2005, Carnival Corporation ordered a four-ship class for their Costa Cruises brand, together with a Holland America liner (Nieuw Amsterdam) and a ship for Princess Cruises (Ruby Princess). This order was one of the largest orders ever placed by a single company. The first ship in this class was the ill-fated Costa Concordia that started her sailings in 2006 and was lost in 2012 when she hit rocks at the island of Giglio near the port of Civitavecchia in Italy. Costa Concordia was followed by Costa Serena in 2007. As the thirth ship in this class, Costa Pacifica was partially built at the Fincantieri yards in Palermo, Italy, where her bowsection was launched at the 24th of july 2007. This part of the ship was then towed to the Sestri-Ponente Yards in august of that same year and finally completed at the 30th of june 2008. After her seatrials at the end of march 2009, the ship arrived back at the yards and she was delivered to the company, before she set sail for her naming ceremony at Genoa, Italy at the 5th of june. Like most Costa namings, this was also to be a spectacular one, and not just one ship but two ships were named simultaniously. 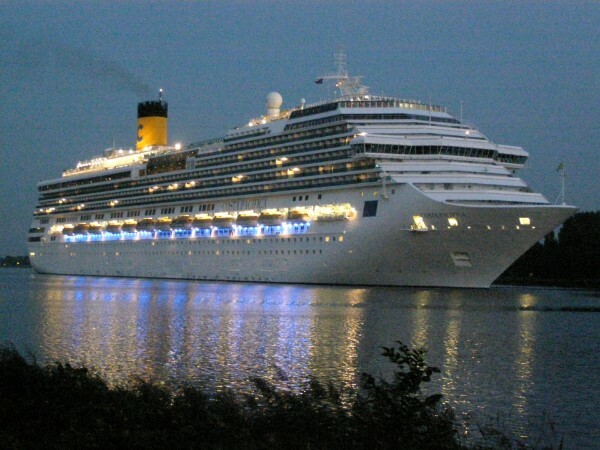 Next to Costa Pacifica, also the brand new Costa Luminosa was named. Also, these ships were named in the same place and were built by the same builder. A rather awkward and a little far-fetched new category was added to the Guiness Book of Records, as the 'Most ships inaugurated on one day by one company'-record was created. It was the worlds first dual naming ceremony, but lets find out who will try and break this record in the future... The ceremony was dubbed the 'Italian portrait in Music and Light', both themes of the ships. Paratroopers of the Italian army as well as the Frecce Tricolori national acrobatic team attended and a large musical gathering of Italian artists headed by Maestro Mauro Pagani took care of the spectators' ears. The show ended when Genoa was overwhelmed with music, fireworks and light. Costa Pacifica has a tonnage measurement of 114.500 and she is 290,20 meters long, 36 meters wide and her draught is 8,20 meters. A total of 3780 passengers can use 14 decks of her total of 17. The crewstrenght is 1100. The ship has a maximumspeed of 23 knots, but her normal servicespeed is 21,5 knots. The ship is powered by 6 Wärtsilä-designed diesel-electric engines. One day after her naming, the ship set sail for her maiden voyage, an eight-day Mediterranean cruise from Costa's homeport of Savona with a special 48-hour stop at Palma de Mallorca. Since her debut, Costa Pacifica kept sailing the Mediterranean and her first sidestep was a cruise in Western Europe at the end of august 2013. One mishap befell her at Marseilles, France when she hit a piling in heavy winds while docking at december the 11th in 2012. An eight meter gash was struck in her hull above the waterline, but this damage was not considered dangerous enough to delay her itinerary. The fourth ship that was meant for Costa Cruises in this class was eventually finished for Carnival Cruise Lines itself in 2008 as their Carnival Splendor and two new ships in the class, slightly altered from the original design, were ordered for Costa Cruises. These became the Costa Favolosa in 2011 and the Costa Fascinosa in 2012.